My friends, family and even those that I roomed with at SNAP! know that one thing I look forward when staying at any hotel… is breakfast when I get to eat a Belgian Waffle. Why?… well because they use a special malted batter that makes my heart sing with every bite! I LOVE malt…. malted shakes, malted waffles, malted candy… its all so delicious! I learned something this year when walking down the aisle with all the hot chocolate and coffee at the grocery store. You can actually BUY malt powder! WHAT? !… I know! This was a life changing moment for me. Soon after my discovery of malt, I began to experiment. 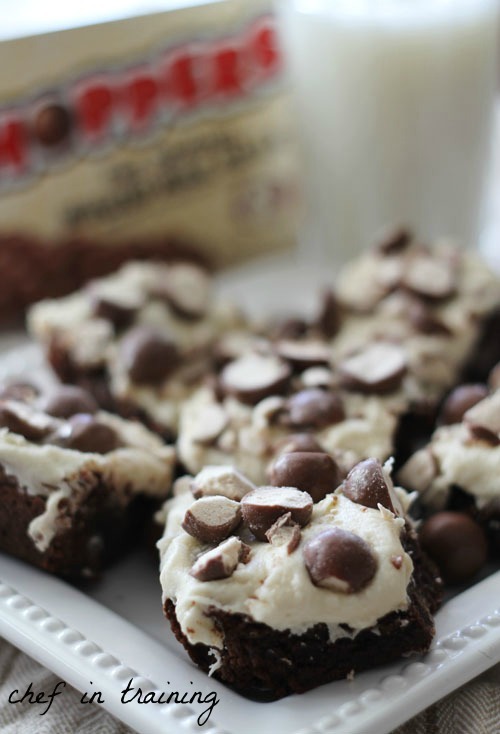 Why not try making a malt frosting to top my favorite brownie recipe?! The end result… Amazing! Where can you find Malted milk powder? UMMM- yes please! These look DELICIOUS!!! So going to make these! These look freakin AMAZING! 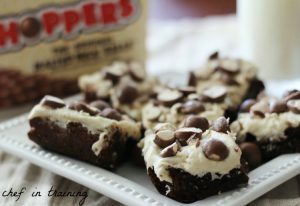 I am a malted milk balls addict so I can't wait to try out this recipe! Also shared it on my bog today: http://seektobemerry.blogspot.com/2012/05/hump-day-distractions_16.html Thanks for the inspiration! I made these today and they are great! The brownies are so good and the home made taste is very evident. I made your nutella cheesecake brownies last week and they are amazing!! Have you tried Pioneer Woman's Malted Milk Chocolate Chip Cookies yet? OMG, you will go ga-ga! They are the bestest! I agree with you, anything malted is to die for!